Sweeeeeet! And I like these blossoms in monochrome. Thought provoking Laura, great post. Beautiful flowers and a lovely series. Your words, as usual, are perfect. 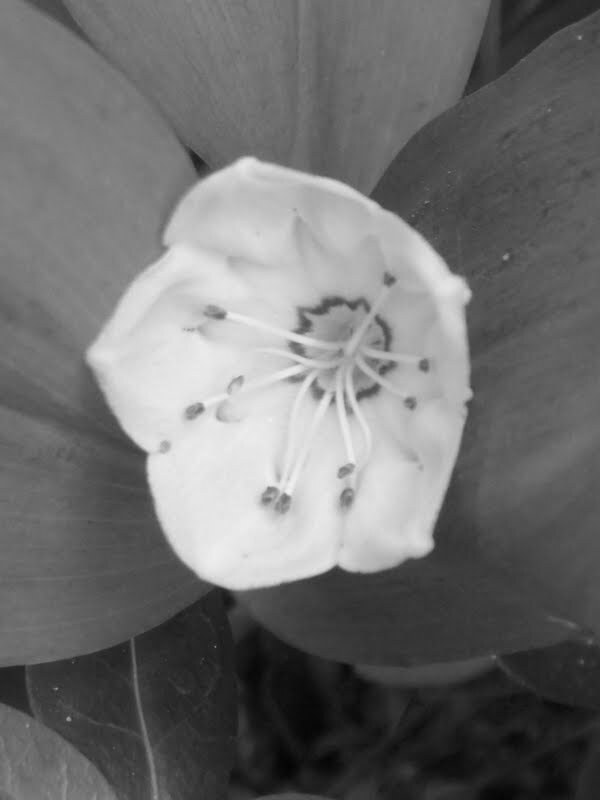 Such beautiful flower pictures in b&w! I enjoyed my visit to your blog very much. Beautiful! "earth's pillow" is so evocative. Black and white makes me feel like a little girl again. Wishing the blessings to overtake you! Beautiful nature shots in black and white. I love the last shot, Laura, it ties the post together beautifully! Connecticut's flower! 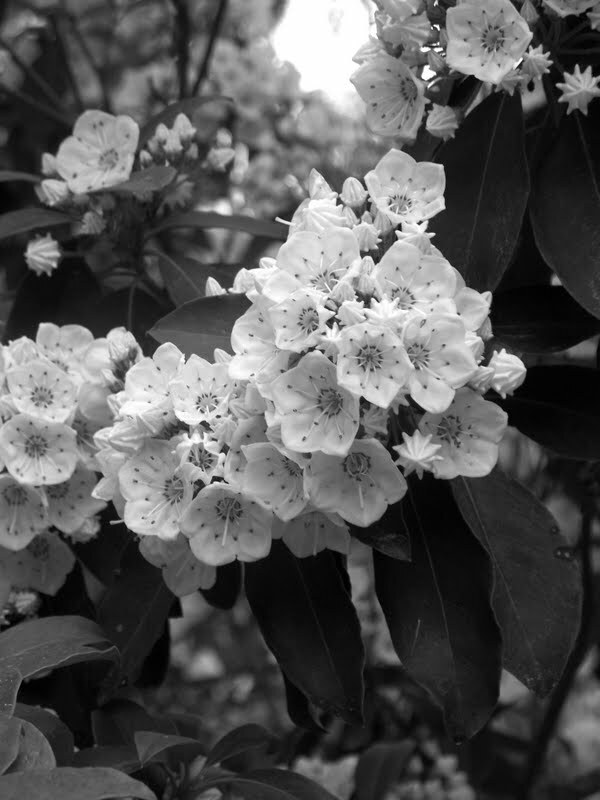 I love mountain laurel. I used to think of these flowers as miniature wedding cakes. They are delightful. 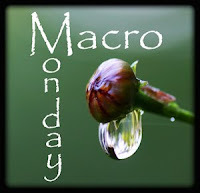 Stunning contrast and detail in your photos. In getting back into yoga in the last month I have never been so glad that "earth's pillow awaits" to catch me when I fall. Back to ground ~ back to where it all began. Thank you for your understanding words over at my place today. This looks classic! Happy weekend! Never seen this flower before--What an unique interesting shape! Beautiful flowers, and your pictures are very interesting in b&w. Is that a rhodendron? I've not ever thought to snap one in monochrome. I love the poetry and the series. Elegant and decent! My favorite flower. I love especially buds which look like exquisite sugar candy and flowers in full bloom are cute parasols. Oh, I missed the beauty of the back. Thanks for poetic words and magnificent shots! In my blog's side bar, there are photos of this flower. A perfect title married to your beautiful photos. The last one is very intriguing, most people do not look at the details of the back of a flower. Lovely flowers Laura, so delicate! by the title alone I knew not what to expect. oh it was so worth it. love that last shot the most. take good care Laura. Poet, singer, sage, mother, Wonder Woman! oh, such beautiful photos laura! i love these flowers - never can remember the name of the evergreen shrub they belong to, but as a child i used to call it the candy plant! we lived in a duplex and they were on our landlord's side of the house, which we weren't allowed on, but i'd sneak over and admire these waxy disks and loved how if you push the center up, the little filaments would detach and spring up straight, flinging pollen on their way! i called it the candy plant because the flowers reminded me of the hard round peppermint candies - white with a little red striping? i was thrilled when i discovered we had several large specimens in our yard when we bought our house, and since then my mother gave me a sweet little one with a fuscia variety of the flower - gorgeous!! The first image is a lovely composition. I like the tonal quality of your B&W. What a wonderful image your words create. The laurel blooms are gorgeous, I love them in monochrome. Nice post and pictures. I like it in b/w. These are incredible black and white pictures, definitely the last one. 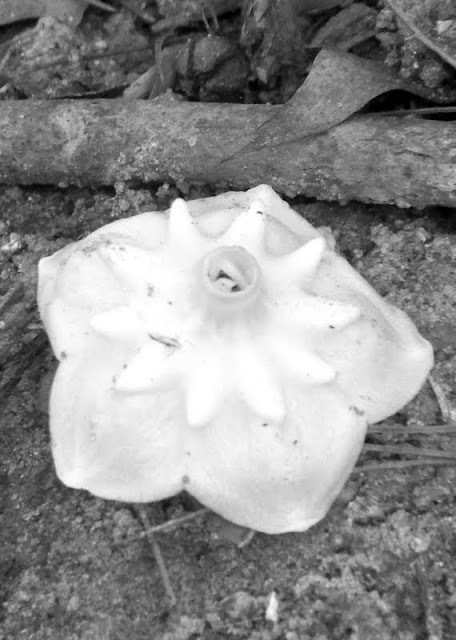 OooOoo, I like how you captured the fallen flower, too. Very creative photography! you have honored these flowers beautifully! Beautiful series, especially ending with the fallen flower. Love the black and white. These are so pretty, I don't think I've seen such blooms before. LOVE that first image - beautifully done in monochrome! Your photos are lovely...but that haiku is superior!!! Such delicate little blossoms. I like these shots in B&W. I have never seen such flowers in my life. I guess it has a marvelous fragrance. Thank you for the beautiful photos. Lovely monochrome shots of a beautiful flower! Thanks for sharing!